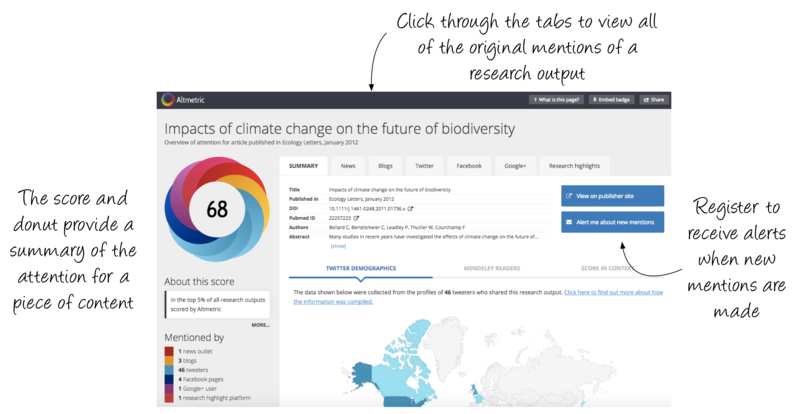 Accessible with one click via the Altmetric donut badges, the details page for each research output gives a full record of all of the original shares and mentions of an individual piece of scholarly content. The summary tab provides demographics data for Twitter and Mendeley users of the research (where applicable) and the ‘score in context’ tab shows how the level of attention this research has received compares to other outputs published around the same time, or in the same journal. The distinctive Altmetric donut and attention score provide an at-a-glance indicator of the type and volume of the attention the research has received. Summary counts on the left of the page shows how many authors from each source type have mentioned or shared the work. The bibliographic details, including author and publication name, date of publication and unique identifiers are included at the top of the record. Each tab on the details page shows all of the original mentions found from that source. You can click on the mentions to read the full news stories, blogs, etc. Register to receive an email each time the research you care about is mentioned in one of our sources (don’t worry, we’ll only send you a maximum of one email a day). Click through to access the full version of the research this attention relates to. 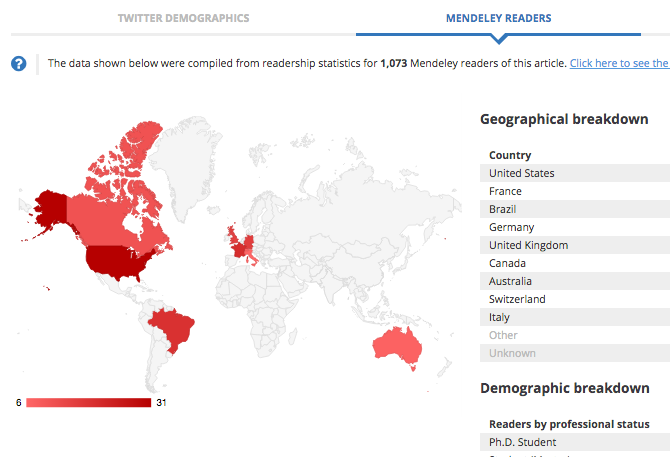 If the research has been shared or saved on Twitter or Mendeley, a demographics map will appear showing the location of the users who mentioned or stored it in their library. All demographic information is pulled from user bio’s. 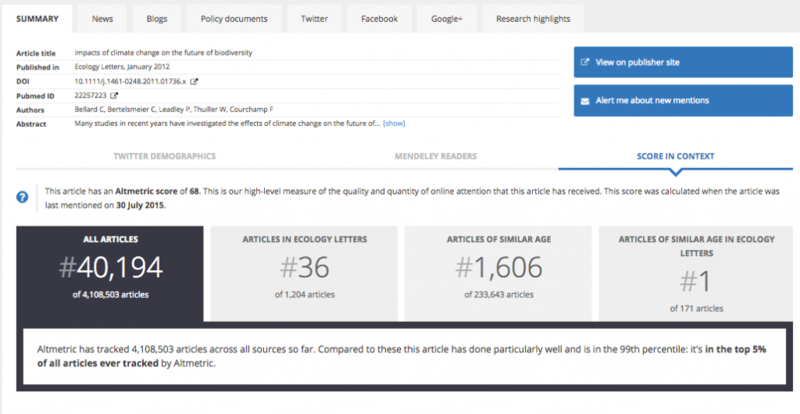 You’ll find the score in context tab on every Altmetric details page – it’s there so you can see how the attention this research has received compares with other research published around the same time, or in the same title. You can find more details on this website about how our technology works, the sources we track, and the Altmetric attention score and donut badges. If you’ve spotted a mention of your research that’s missing from the details page, please fill in this form with the relevant links. You can find out more about why we sometimes miss mentions in our knowledgebase.